On Friday, a woman in New York City named Minhee Cho ordered food at Papa John's. In lieu of her name, the cashier included a description of her on the receipt. Cho posted a picture of the receipt on Twitter, and over the weekend it went viral. Why? Well, just read the description. Papa probably wishes he weren't in this house. No, your eyes don't deceive you. 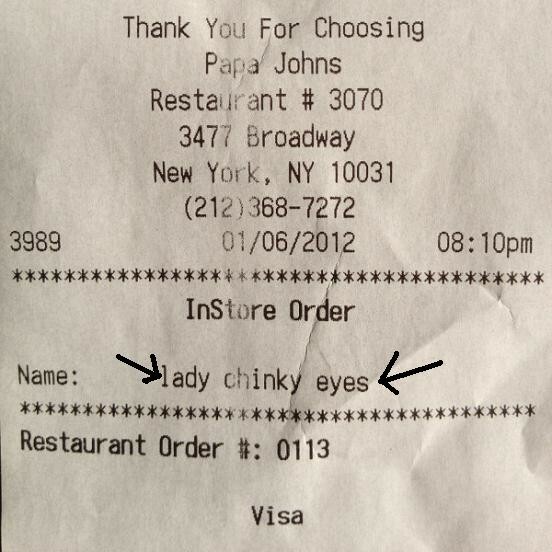 It actually says, "Lady chinky eyes." The cashier has been fired, and Papa John's has offered its apologies.